New Delhi: Conversation is civilized speech. It is more purposeful than chatter; more humane than gossip; more intimate than debate. One of the Capital city’s oldest art galleries Gita Art Gallery which recently reopened as GAG Moderne in collaboration with Empowerment N. G. O organised the inaugural edition of “Underground Talks”, at GAG Moderne, Sadhna Enclave. 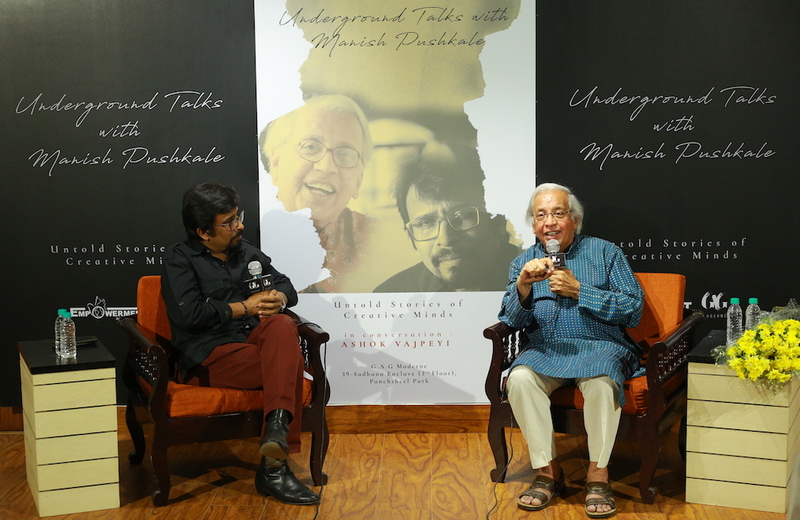 Manish Pushkale was in conversation with Ashok Vajpeyi a noted poet, essayist, literary-cultural critic, cultural and arts administrator, and a former civil servant. In a freewheeling chat, they talked on the “role of an artist in today’s time”. Underground Talks are a series of conversations between artist Manish Pushkale and an eminent guest from the art scene each month. These talks will focus on subjects of burning interest to the public, giving the creative fringe of society an opportunity to articulate intelligent, opinion in the mainstream, to foster learning, inspiration and provoke conversations that matter. The first conversation was organized recently at the gallery. Talking on the role of an artist in today’s time Ashok Vajpeyi said “There was a time when artist would speak up especially for the nation, but now the artist community has gone numb. Now days artist are campaigning for the political parties so as to get a Padma award. This means you are involved in the thing then why not speak up. Important thing for an artist is to create things, but you need to show some moral responsibilities towards the nation as well. Arts cannot leave the notion of making, basically, arts is the notion of making impossible things possible. The day you start believing that you don’t matter than gradually your creativity will come to an end”. Further talking on the subject of arts he said “Arts is a spiritual form of creativity, one should look and notice things around. Look can be a creative look or an imaginary one. But if you look and don’t notice or vice a versa then you cannot be creative”. Re-launched as “GAG Moderne” earlier this month, Neha Talwar and Anirudh Tripathi now head the gallery in its new avatar. Its debut exhibition ‘Paradox of Silence’ curated by NeAnGo studio is a show featuring works of masters like Rameshwar Broota, Manish Pushkale, Manu Parekh, Mona Rai, Amitava Das, Shobha Broota, Hem Raj, Kalicharan Gupta etc. Besides a meticulous display of some of the chosen works of the aforementioned artists, there is a spellbinding installation by NeAnGo Studio as well. This show has now been extended and will now end on 20th of April. Formerly Gita Art Gallery, GAG Moderne, is a retailer and repository of umpteen contemporary paintings. Established in 1964 by Mr Kuljeet Singh Butalia, and, is indisputably the oldest art gallery in the Capital. Mr Butalia’s passion for art led him to not merely showcase but possess paintings of all kinds- be it abstract/semi-abstract form to or some combination of these elements. Having started his journey at a time when art flourished in the Asian region but perhaps, didn’t find as many lucrative deals as it does in the new millennium, he revolutionised the modern and contemporary art in India. Since then, for more than five decades, Gita Art Gallery has showcased some of the unique and finest exhibitions of modern and contemporary art in India building up a gateway of Indian art in the world market. It has constantly made a landmark success in promoting Indian art globally too. After lying dormant for a few years, the gallery is getting reinvented by Neha Talwar and Anirudh Tripathi, keeping up with the latest trends of the art market to reach out to a wider audience of fine arts. Thus, from traditional and modern paintings, sculptures, installations to more contemporary media like mixed media, conceptual art, video art, and experimental art, the gallery – re-christened as GAG Moderne – is once again envisioned as an arena for all the passionate lovers of artworks of quality & everlasting value. NEANGO is a trio of Neha Talwar, Anirudh Tripathi and Gopal collaborating together on installation arts. Their very first work together for GAG Moderne is ‘Machcharnama ka chapter One’. NEANGO STUDIO will also focus on some of the best-known works of the young artists, besides having the spotlight on the masters of art from India who have earned an incomparable and matchless reputation across the world. They will also shortly be sharing their calendar of events for GAG MODERNE for the year with the press and the public. These are citations for the progressive art movement in New Delhi.